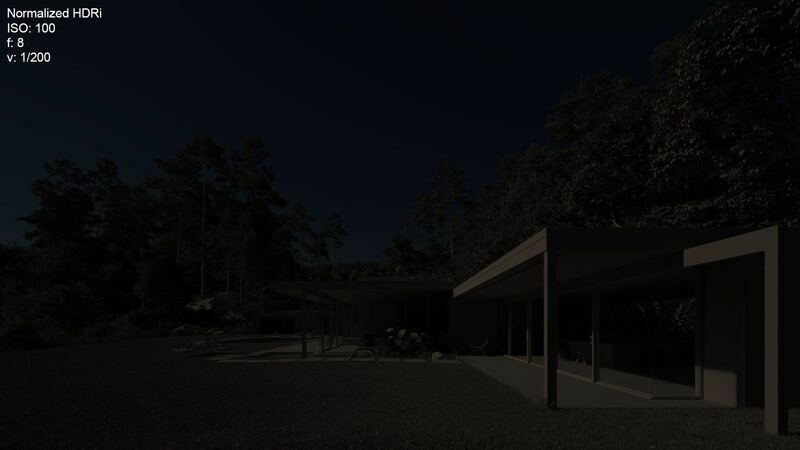 When lighting an ArchViz project, one of the most popular methods, is what we know as IBL (Image Base Lighting), which consists of using a 360º high dynamic range image (HDRi) as a source of lighting to reproduce the conditions of the real sky at the time of capture, as accurate as possible. However, this technique has some important limitations and inconvenients, and that is why incorrect HDRi can cause problems when it comes to lighting our projects, sometimes causing worse results than automatic sky systems and sun that are included in most render engines. We have designed this HDRi pack with the needs of professional architectural visualization environment in mind, creating HDRi images, calibrated, high resolution, easy to use, that guarantee good results in any situation. WHAT DOES THIS PACK INCLUDES? 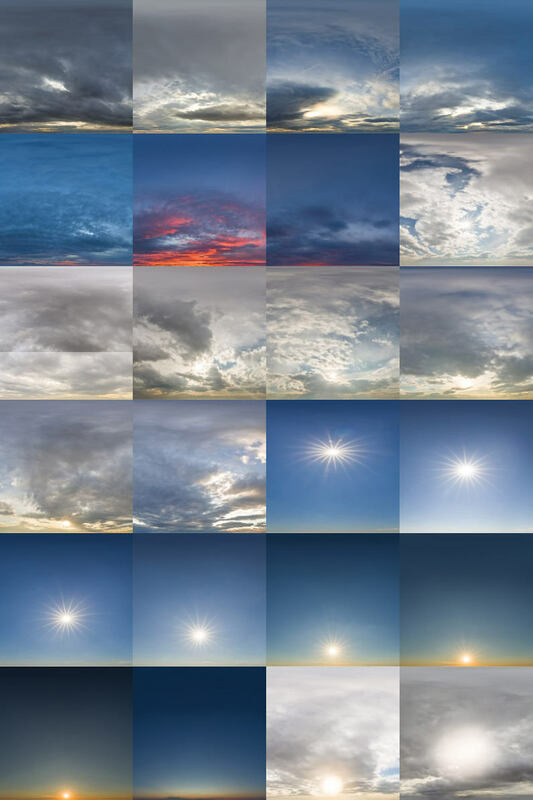 When capturing HDRi in skies with visible sun, one of the most common problems is the lack of dynamic range, due to the limitations of any real camera. 3D Collective’s HDRi have all the necessary dynamic range so you do not have to modify anything in the file, and so that you can obtain real values of exposure and luminosity in your projects. Simply load one of our HDRi and adjust it’s multiplier with the provided value to have a realistic lighting and a camera exposure matching real values. In order to capture all the dynamic range present in the sky, .HDR or .EXR files are used, but these high dynamic range files do not have infinite storage capacities, this means that when the dynamic range present in the sky is especially large (when see the sun for example) it is not possible to store the luminosity information in an absolute way so that each pixel of the HDRi represents exactly the luminosity of the sky at that point. In these cases, it is necessary to “Normalize” the exposure of the HDRi in order to store all the information without losing anything. 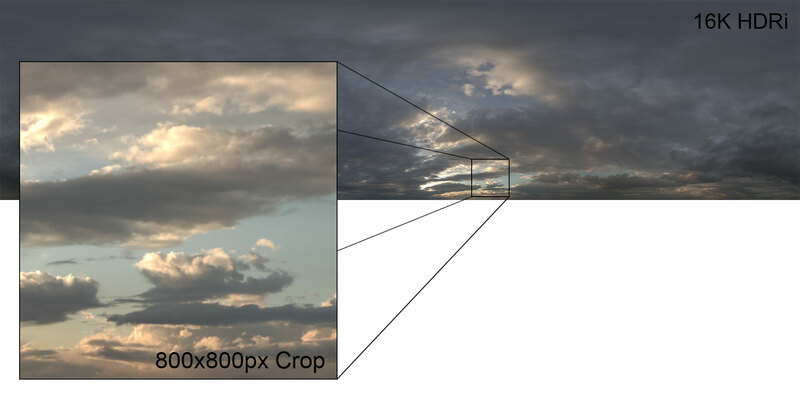 This is a problem in many of the HDRi available in the market because it is difficult to accurately reproduce the actual values ​​of the sky at the time of the capture. In this pack, all the HDRi that have been normalized, are accompanied by a multiplier that will allow you to recover the absolute values ​​of exposure so you can work with real values ​​in camera, simply using that value as a multiplier of your HDRi. Enough with adjusting the inverse gamma and all tests error to try to fix the HDRi. This information is found in the name of the HDRi and in the PDF of the product. When it comes to capturing HDRi images, the most common, is the use of fisheye lenses that allow a very fast capture of the photographs due to their wide angle of vision, however, this type of lens usually has problems of chromatic aberrations and they do not allow to generate images of high resolution. In order to offer high quality 16K HDRi, all the skies of this pack have been captured with high resolution (50+ MP) cameras and high-angle rectilinear super angular lenses to minimize chromatic aberrations allowing an original file of more than 24K which is then reduced to the final 16K HDRi file to reduce noise and guarantee the highest quality standards. When using HDRi, there are several possibilities: we have HDRi that besides the sky contains the original horizon of the place of capture, this can cause the trees, buildings, mountains, etc. from the place where the sky is captured are reflected in our projects. This can be useful to make a quick LookDev , however, when presenting a final project, it is preferable to have independent control over the sky and the horizon. All our HDRi have been captured and modified to completely eliminate any trace of elements outside the sky on the horizon, which allows to have a sky with a 180º coverage in your projects. Another challenge when capturing HDRi images is preserving the original colors and color temperature to ensure consistency and allow a color temperature control similar to that of a photographer in real life. All of 3D Collective’sHDRi have been made with the help of several systems to check and correct the color and the exhibition such as Color Checker, Luxometer, letter of grays, etc. 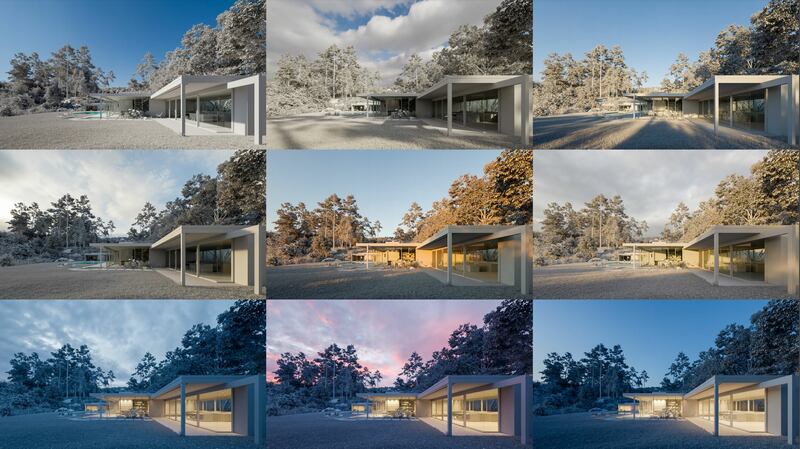 If you want to modify the color temperature of your render, you can do it as a photographer would do in the physical camera or in post-production. Such a nice pack with a resonable price, thanks CGI-Community for this collection. Super collection of hdri!!! Thanks a lot to CGI Community! Thank you CGI Community for this great collection…. i think this is a very good contribution. like always thanks cgicommunity. Thank you cgi community! , this is a great collection.. Thank you very much as always for the great contribution CGI team !!! Another great CGI release. I want to thank everyone involved for making this possible for all members. Thank you!